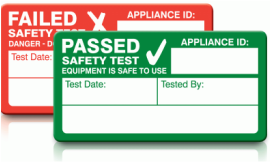 Portable Appliance Testing (commonly known as PAT or PAT Inspection or PAT Testing) is a process in Ireland by which electrical appliances are routinely checked for safety. Employers and employees are now legally obliged to take reasonable steps to ensure that all electrical equipment is safe to use. Regular PAT testing is required for electrical applicances such as kettles, computers, powers tools etc. This regular testing ensures that the equipment is safe to use for a specified period of time. This period of time dependent upon the appliance and also the environment in which it is being used. All our qualified engineers are specialists in electrical testing and provide a reliable, professional and nationwide service to companies, theatres, educational institutions and other types of organisations. As experts in PAT testing throughout the greater Dublin area, we can help you meet your legal requirements in this regard. Our engineers use correctly calibrated professional PAT Testing machines. What is involved in PAT testing? All equipment undergoes an initial visual inspection to ensure both the flexible cable and the appliance are free from wear and tear, damage, and signs of burning. Plugs are also inspected for correct wiring. Using PAT testers we can test if the appliance has passed or failed testing including earth continuity, lead polarity, and insulation resistance. This is a relatively quick process which shows if the appliance passed or failed to show show safe your portable appliances are. Once each appliance completes the test, they will be labelled with a safety sticker with a barcode for ease of tracking in the future. The Safety, Health and Welfare at Work (General Application) Regulation’s S.I NO.299 of 2007 means that there is a requirement under Irish law that all businesses carry out PAT Testing on all portable appliances. This is to ensure the safety and welfare of both employees and customers.